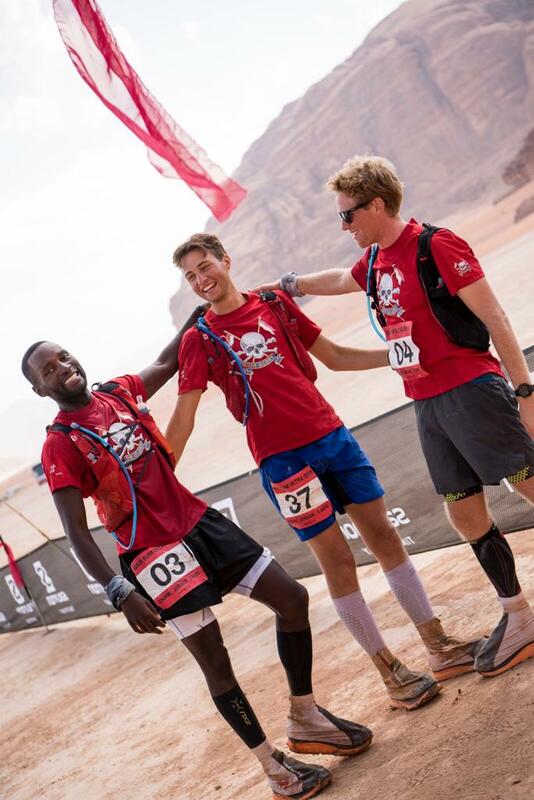 Charlie Henson, Julien Anani-isaac and Toby Free have just returned from the Wadi Rum Ultra in Jordan. The 5-day running race covers some 250km over the gravel, compacted earth and sand of the famous Wadi Rum, which is known for its spectacular landscape of vast granite and sandstone outcrops. The race has a slightly different format from many of the other multi-day staged runs in that it is partly supported. Runners are required to carry their gear for the day’s run – energy bars and basic medical and emergency equipment (water and medical care is provided in checkpoints) - however organisers move other equipment (bedding, general food, spare clothes) forward to the next camp. The three ran as a Team, The Royal Lancers, in aid of Help for Heroes, the military charity that works to help injured servicemen and their families – if you would like to donate, you can do so through his link here. They were also supported by Ember Biltong. The Wadi Rum Ultra has been rebranded as the Ultra X Jordan and in 2019 it will take place from 5th-13th October. To find out more about Ultra X Jordan and other races in their calendar, see their website. Photorgaphs credit Benedict Tufnell. 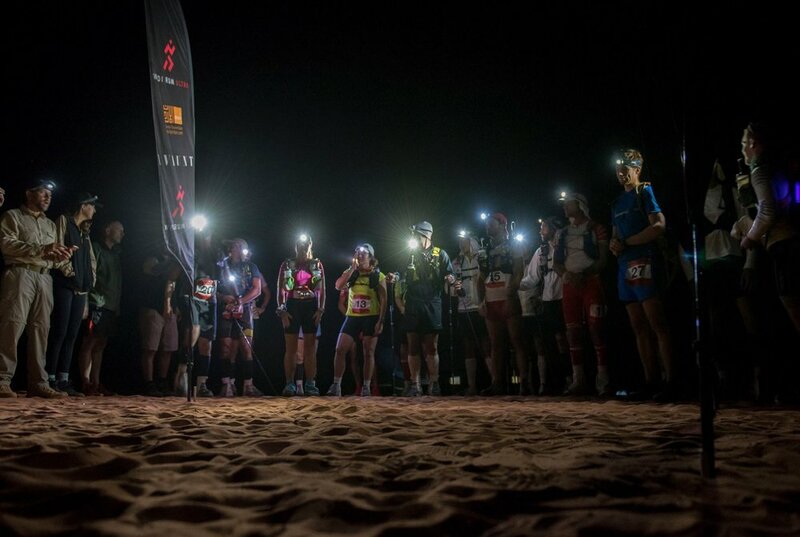 What is the Wadi Rum Ultra like? 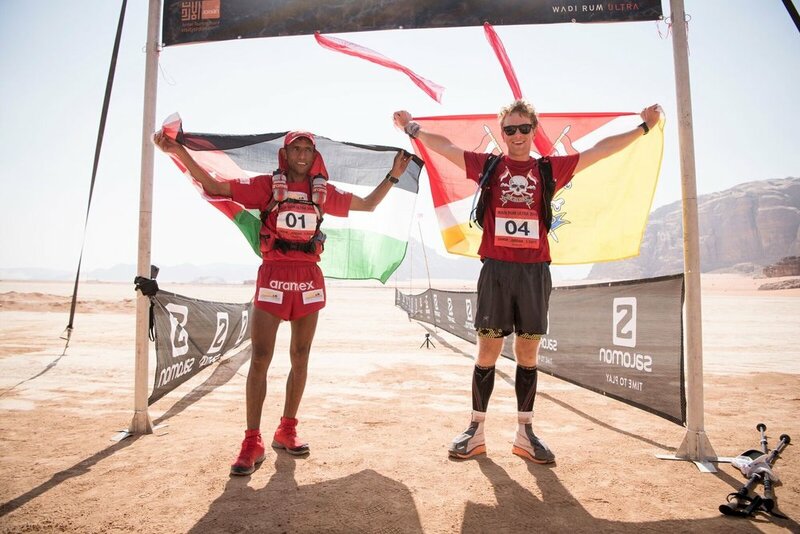 Charlie Henson: What makes the Wadi Rum Ultra so special is the scale. There are less than 50 runners, which makes it so intimate and very quickly you feel like a family. The group that run it are wonderful people and they really make it special. There is a Bedouin feeling to the event which is both charming and welcoming. Temperatures were between 30-40 degrees and the course is run over flat open plains among stunning rock formations and features. The terrain underfoot is mixed; about half and half between shifting loose sand and firmer, gritty terrain. Stages vary from 70km at the half way point, to 30km on the final day. Another variation from other similar events is that you do not have to carry all of your equipment, only what you require for the day. This is offset however by comparatively faster cut-off times. The race went really well, a lot better than expected, in fact. I was just hoping I had done enough to complete the course. My main priorities were to not get injured and to finish, in that order. My teammates Julien, Toby and I were fortunate to be living in Cyprus in the build-up to the event, so during training we managed to get some good miles in with high temperatures. We started off very naively in terms of strategy, setting off far too quickly on the first two days. We let the excitement and competition cloud our better judgement – which then made for very painful final stages and probably slower times overall. Over the course of the race I found that the best way for me was to find a nice slow rhythm that I felt I could maintain all day. I would relax and enjoy the view until the last 10km. At that point I would put my headphones in, play my Heavy Metal playlist and see what was left in the tank. We were delighted to finish 2nd, 5th and 13th, something we would never have believed it possible at the start. Did the race organisation live up to expectations? Absolutely. The race organisation was slick and professional. The routes had been selected really well to give a balance of different terrain and to take us through the most stunning scenery. The fourth day in particular was incredible, taking us through an amazing ravine that you almost had to climb down to proceed. In terms of route selection, I found the second day particularly tough. It was almost exclusively on soft, shifting sand which sapped so much energy - and it was one of the hottest days. The real-life support was also excellent. There were three doctors and two physios, all working to keep us in the best shape possible. There was even a study being conducted by a Cambridge University PHD student, his data making very interesting reading on the energetics of prolonged physical exertion in stressful conditions. Were you as well prepared as you could be? With hindsight I feel that I was about as well prepared as I could have been, though this was due more to blind luck and circumstance than anything! I started training about 6 months out. I was not particularly scientific about it but just followed a few golden rules. I always ran at least 53 miles a week (10 miles, 10 miles, 20 miles, 13 miles), rising to around 60 in the last few weeks. This distance was chosen fairly arbitrarily; it was just what I was able to fit in around my work schedule at that time. I ran during the hottest part of the day wherever possible, and was lucky to be living in a hot country at the time. I stretched and foam-rolled for 30 minutes every morning and evening. I took nutrition seriously for the first time in my life, eating as healthily as I could. I actually did a ketosis type plan with low carbs and high levels of healthy fat. I found this worked well but would urge others just to find what works and makes you feel strong and healthy to go and run week in week out, whatever that might be. Two weeks before the event I ran a 50K Ultra Marathon in the mountains in Cyprus with my teammates Julien and Toby. This was a great way to see how far we had come and to focus our minds for the big event. For the two weeks before the race I did very little, just a couple of short runs, stretching and eating plenty. During the race I found nutrition to be highly important too. I had learnt in training that I really do not like gels. I nibbled on Droewars and Ember biltong in the early miles and that kept me feeling strong. Then later I would have Bounce Protein Balls and Velaforte Energy Cubes. Everything was pretty natural and that prevented me feeling unwell or having to ride an energy rollercoaster. Electrolyte solution and salt tablets throughout seemed to keep me feeling relatively human. In terms of kit I found that poles worked really well for me. They allowed me to take the weight and strain off my legs and helped me through the more painful periods. My trainers and gaiters (Hoka One One Challenger ATRs, Raidlight Desert Gaiters) were awesome throughout. I did not get a single grain of sand inside and only a couple of blisters. One thing I would change would be to get the longer straw attachments for my water bottles. They looked much easier and comfortable to use than the normal lower ones. What was the most painful moment? Physically the hardest part was the last 10km of the 70km day. This was a long run home down a dried-up riverbed in the full heat of the midday sun. We had been running for 7 hours by that point and the legs and engine were really starting to feel the strain. For the study mentioned above we had swallowed thermometer pills to record our bodies core temperature that day. Mine recorded a (thankfully brief) peak of 40.1 degrees. This was the only time that I felt truly awful, slowing down to a walk (or drunken-like stumble!) to take on some water and cool down. Thankfully this worked and I was then able to continue a bit more strongly. The long day as mentioned above was particularly really special. It starts at 4am under the stars. It is cold and clear and there is a real buzz among the runners. You run as the sun comes up and it was just stunning. Finishing that day was probably my favourite moment, the sense of achievement and relief combined with the fun of sleeping out in the open on an amazing shelf of rock overlooking the valley. Julien, Toby and I also huddled around an iPad to watch a couple of episodes of Friends. While not at all the sort of thing we were there to enjoy, howling with laughter at some 90s humour is a strong tonic for sore legs. A very special event that is entirely achievable and 100% the best way to see one of the most stunning places on the planet. A Life of Adventure would love to keep you posted with stories ideas and tips about well... adventure. Sign up and we'll send occasional inspiring, pithy and hopefully funny messages about how to find adventure and the people involved. We promise not to bombard you and will never sell your email address on.